Keeping the state on a path to long-term fiscal stability, Governor Edmund G. Brown Jr. today proposed a $131.7 billion General Fund budget plan for 2018-19 that fills the state’s Rainy Day Fund to its constitutional target, fully implements the state’s K-12 school funding formula two years ahead of schedule and provides $4.6 billion for the first year of a 10-year transportation improvement plan. In stark contrast to the $27 billion budget gap of 2011, the 2018 fiscal plan reflects a healthy one-time surplus and increases funding for education, healthcare and other core priorities. But with growing uncertainty about the impacts of new federal policies, combined with a longer-than-average economic expansion, the budget continues to bank higher revenues into reserves and pay down debts and liabilities. Proposition 2, approved by California voters in 2014, established a constitutional goal of reserving 10 percent of tax revenues in a Rainy Day Fund. By the end of the current (2017-18) fiscal year, the state’s Rainy Day Fund will have a total balance of $8.4 billion, or 65 percent of the constitutional target. The budget proposes a $3.5 billion supplemental payment in addition to the constitutionally required transfer to the Rainy Day Fund for 2018-19. The two payments would bring the total Rainy Day Fund to $13.5 billion. In 2013, the state enacted the K-12 Local Control Funding Formula to increase support for the state’s neediest students and restore local district flexibility over how money is spent in schools. With $3 billion in new proposed funding for the formula in 2018-19, the budget will achieve full implementation of the formula two years ahead of schedule. To improve student achievement and transparency, the budget proposes requiring school districts to create a link between their local accountability plans and their budgets to show how this increased funding is being spent. The minimum guarantee of funding for K-14 schools in 2007-08 was $56.6 billion and dropped to $47.3 billion in 2011-12 at the peak of the state budget crisis. From this recent low, funding has grown substantially and is projected to grow to $78.3 billion in 2018-19 – an increase of $31 billion (66 percent) in seven years. For K-12 schools, 2018-19 funding levels will increase by about $4,600 per student above 2011-12 levels. The budget proposes the creation of the first wholly online community college in California. The online college would provide a new affordable pathway to higher wages through credentials for those who don’t currently access the California community college system. The budget proposes a total increase of $570 million (4 percent) for community colleges, including a new funding formula that encourages colleges to enroll underrepresented students and rewards colleges for improving students’ success in obtaining degrees and certificates. As the new formula is implemented, no district will receive less funding than currently provided. Included in the community colleges budget increase is $46 million for the first year of implementation for Assembly Bill 19, which allows colleges to waive tuition for first-time, full-time students. Additionally, the budget again increases state support for the University of California and the California State University by 3 percent. Since the end of the Great Recession, the University of California has received $1.2 billion in new funding and the California State University (CSU) has received $1.6 billion. Over the same time period, funding for state financial aid that primarily supports low-income and first-generation students has increased by $623 million to a total of $2.3 billion. Given these funding increases, the budget reflects flat tuition and expects the universities and community colleges to continue to improve their students’ success. With no tuition increases this year, university tuition, adjusted for inflation, will be below 2011-12 levels. Amidst growing uncertainty at the federal level, the budget again provides funding to increase health care coverage to low-income Californians under the federal Affordable Care Act. California continues to be the national leader among states in implementing the optional expansion of ACA with nearly 3.9 million Californians covered in 2018-19. • A focus on “fix-it-first” investments to repair neighborhood roads, state highways and bridges ($2.8 billion). • Making key investments in trade and commute corridors to support continued economic growth and implement a sustainable freight strategy ($556 million). • Matching locally generated funds for high-priority transportation projects ($200 million). • Investing in local passenger rail and public transit modernization and improvement ($721 million). 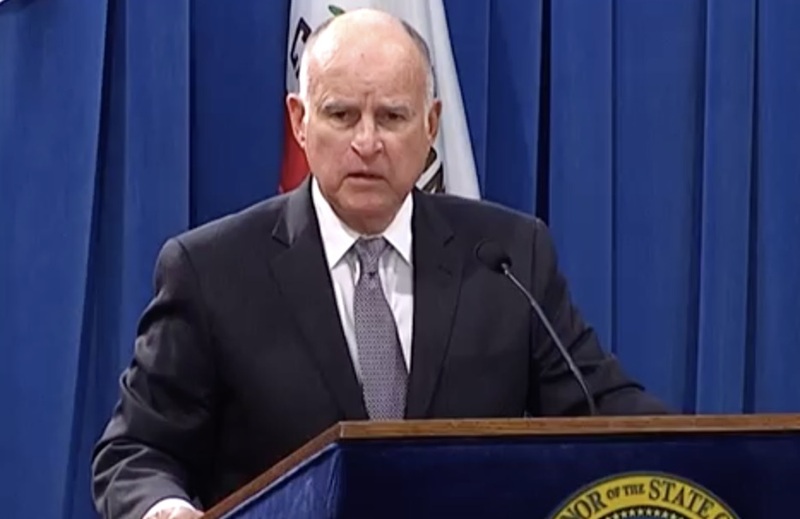 In May 2011, Governor Brown identified a $35 billion Wall of Debt – an unprecedented level of debts, deferrals and budgetary obligations accumulated over the prior decade. That debt has been substantially reduced, and now stands at less than $6 billion. California continues to work towards a state goal to reduce greenhouse gas emissions 40 percent below 1990 levels by 2030. In July, Governor Brown signed legislation to extend California’s landmark cap-and-trade program through 2030. Since then, auction proceeds have stabilized and revenues have increased, resulting in $1.25 billion in cap-and-trade funds available for appropriation in 2018-19. The plan for these funds will be announced in conjunction with the Governor’s State of the State Address. The full summary of the Governor’s budget proposal can be found at www.ebudget.ca.gov. Why post this? Anything he presents will be a lie. Then he’ll say “Oh, we underestimated this and overestimated that. Oooops, sorry.” He’s a lying sack of crap and he gets away with it every year. Any extra tax dollar he gets goes to more govt. employees and inflated pensions that they already can not afford. He just hides it in other figures, things that never really happen. California is doomed because of this idiot. He always was an idiot. Jerry brown is an idiot. What about the 252 billion owed to retirement funds? He gave that to the illegals, you worked for free. That’s what the gas tax was for… oh wait. That’s right, they decided to give themselves raises a few months after that gas tax was put into place.